I fell in love with math when I was a fifth grader. A dear friend of mine challenged me to complete all the math problems included in our workbook, even though our teacher had only started to teach the first few pages. I didn't realize that accepting the challenge would change the rest of my life. Now, I understand why some kids may feel encouraged when their friends challenge them to a match. If your kids can't withhold themselves against a challenge, you might appreciate my app pick for today: Math Champ Challenge. It's a math workbook app that has competitive features applicable in a duel or even a classroom setting from Grade 4 to Grade 7. Once you have selected a Grade that you want to play, you can choose one of five difficulty levels from Easy to Super Nerd. In each level, the app will generate 30 random questions covering all Common Core State Standards math curriculum for that Grade. All questions are in multiple choice format with one correct answer. Each question has a timer, mostly less than a minute. When you choose the correct option, the remaining time will be converted into your score. If you manage to answer within a few seconds, you might even get bonus points for being fast. But if your answer is incorrect, you will get a penalty (minus points), reducing your total score. At the end of each level, you will get a summary of areas where you need to practice more. Skill Builder is a separate section in the app where you can practice your skills without being timed. The questions may also be open-ended, where you enter in your answer using the keyboard instead of choosing one from the available options. After you select a Grade, you will see five domains - each representing several clusters of similar topics. For example, in Grade 4 and 5, you will see domains such as Algebraic Thinking, Fractions, and Geometry. For each practice session, you can select any number of domains at the same time. If you select more than one domain, the app will mix questions from these domains into the practice set. The Skill Builder also has a feature called Personal Learning Environment, which will provide questions with adaptive difficulty levels. If you manage to solve many questions in a cluster/domain, the app will generate more difficult questions. Otherwise, the difficulty levels will remain fairly the same. Math Champ Challenge is released in two versions: free and paid. The free version includes the Easy challenges for Grade 4-7 for free. If you want to play all the other levels, you need to unlock them via a single in-app purchase. I'd recommend you get the paid version - called School Edition - instead, because it has unlimited access to all the contents, including the Skill Builder. The app supports multiple player profiles. 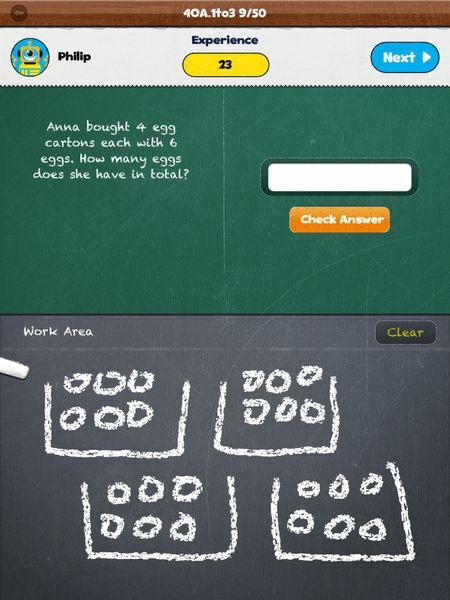 In fact, the name School Edition suggests that the app can be used in a classroom setting. All achievements and badges that have been awarded will be tracked separately for each profile. I like the app's approach to include a blackboard section at the bottom half of the screen, called Work Area. It's a perfect area for you to calculate your way into the final solution. If you're playing it with your junior, you can also draw some illustrations to translate the word problems into a more visual or mathematical model. The app has a total of 2,500+ questions built into it. As an adult who loves math, it took me hours to play with all the contents in Skill Builder and Challenges for Grade 4. I believe it would take many days (or even weeks) for juniors of that Grade to play with all the contents. And once they're ready, they may even start practicing for higher-level contents. Math Champ Challenge is a high quality math workbook app with built-in competitive features that are perfect for kids in Grade 4-7. Its support for multiple user profiles allows you to use it in a classroom setting. I'd recommend it for anyone whose kids are in that age range. It's a must-have math workbook app. Get Math Champ Challenge on the App Store. Mathemagics. Learn the tricks for solving math problems in a heartbeat. Jack and the Beanstalk - A Mathematical Adventure. Clever app disguises math problems within a famous fairytale.